If you like the heat, Palm Springs is the perfect weekend getaway. The day may be spent by the pool, but as the sun starts to set, the temperature drops just a bit and, if you are lucky, a warm breeze starts to blow. It’s nice to sit outside for a bite to eat and a drink. Located in the front of the Hyatt Hotel in Palm Springs, HooDoo is that spot. 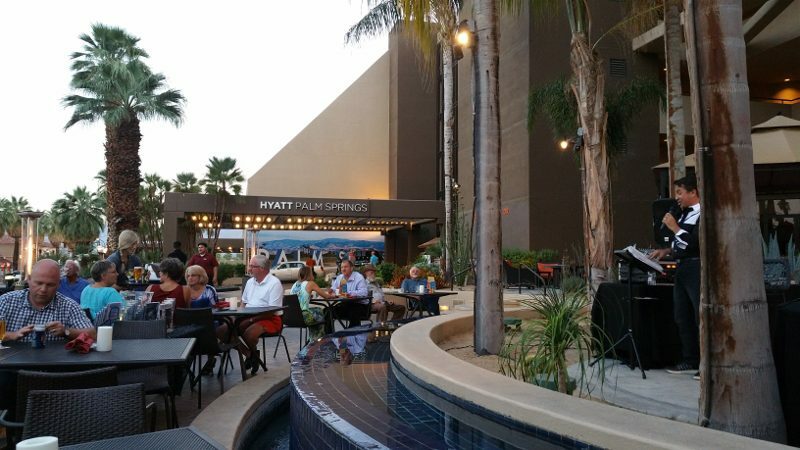 Grab a seat in the shade, watch the people walk by on Palm Canyon Drive, listen to live music (on Saturday nights) and enjoy the open air. In order to please the palate, I eat out a lot! And, I eat a lot of really good food. In order to not feel guilty when I indulge, I make sure to workout regularly. So, it was a perfect fit when I was invited to the inaugural event for Allison Hagendorf’s new “FIT TO FEAST” Event Series. With demands for fairness, transparency and accountability when dealing with employees, customers and society-at-large, there are major influences shaping the restaurant industry. At the 19th Annual UCLA Extension Restaurant Industry Conference, leaders in brand development, food service design innovation, operational excellence, market analysis and customer satisfaction explored the demands for high-quality ingredients, local sourcing, healthful menus, natural and minimally processed food, and sustainability. In a series of mini presentations, structured like TEDx Talks, Steven Goldstein of The Culinary Edge spoke about current culinary trends, Fred LeFranc of Results Thru Strategy and Chef & Author Andrew Hunter discussed the guests’ journey, and Darren Tristano of Technomic tackled the future of eating local. Understanding the forces that create change in consumer behavior, both inside and outside of the restaurant industry, is of the utmost importance in understanding restaurant consumers’ needs. Consumers today are overwhelmed with choices. We can get what we want from where we want, when we want it. We don’t need anything new, and if another restaurant in the U.S. never opened, we would not run out of choices or go hungry. With this freedom of choice, we live in a society that Steven Goldstein deems “democratized consumerism” because consumers are involved in the process of where they go. 1. We live in a share economy which creates economic democratization. There is a new form of capitalism, and commerce has shifted. Lyft has transformed the traditional taxi service, FlightCar is changing the rental car industry, EatWith allows consumers to open a restaurant in their home, sell tickets and make social connections, Yerdle is the new pawn shop 2.0, and Hoffice is creating a collective work environment by bringing people into your home and increasing productivity. Consumers are now hosts, competitors, collaborators, industry peers, influencers and experience sharers. 2. We are redefining local community democratization and, in many ways, moving backwards as we move forward. The term “local” has shifted in meaning. Ten years ago, the term was used to describe where you were from. Now, it is about how we shop or eat. With companies like Good Eggs bringing the farmers market to the online grocery store, Sprig delivering restaurant-quality healthy meals to the home, Local Food Lab being an online community for farmers to startup businesses, and Culinary Backstreets offering local food tours through cities, “local” today is more than where your food is from. It represents one’s location, lifestyle, ideology and positioning. 3. There is a new definition of urban, resulting in lifestyle democratization. Urban is in. There is a desire to be cosmopolitan and a yearning for centers for gathering. The Tampa Waterfront 20/20 in Florida is America’s first crowdsourced neighborhood. Pinewood Social in Nashville, Tennessee is a space for social gathering that can accommodate needs morning, noon and night — from coffee and meals to bowling, swimming and karaoke. Chefs have moved to Oklahoma City, Sacramento, Indianapolis and other cities where there is a need. And they are serving food that can be found in major cities like Los Angeles and New York. Urban is redefining how we live. 4. The anti-chain is the future of democratization. Labels are less in vogue. Tastemakers seek the unknown. They want to be individualistic and find the “one-off.” Hotels like Soho Grand, AC Hotels and Moxy Hotels offer affordable luxury. People don’t want name brands. They don’t want to stay where their parents and grandparents stay. The idea is that it is cool to be different. Brands are a reflection of the people who are using them. Steven Goldstein concluded that as the consumer has more options with brands vying for their attention, a restaurant must evolve and differentiate themselves. The question is: How can experiential value be created as opposed to monetary value? There is a need to build empathetic, social currency into brands. How does a brand remain relevant in an ever changing world? We live in what Fred LeFranc calls a “white water world,” where things are constantly changing. As a result, a company has to be nimble. Businesses cannot control a brand; they can only influence it. A company’s brand vision is intangible and the tangible aspects of the business are the marketing, financial market, the concept execution and the culture. And it is the culture that is the secret weapon. The leadership, values, clarity, rewards and transparency are what make a business unique. Dining is a sensory experience, a combination of senses — taste, smell, touch, see, hear — that together make the meal “delicious.” A restaurant model works if people are fully engaged in the business. If the customer’s experience is a by-product of financial targets and operating mechanics, it will face immense challenges. An enlightened restaurant will set a clear vision and brand strategy and then redefine the guest’s journey and change the organization to match it. Technomic did a study that reveals how consumers define the term “local,” finding that consumers report seeing more local foods in restaurants, and 57% of consumers say they seek out restaurants offering locally sourced products at least sometimes. Consumers are aware of and place value on locally sourced products in restaurants. Using local products is not only fresher, it also supports local businesses. Where restaurants can see growth opportunities is in targeting menu items and positioning in the consumer’s mind.